As a part of my knowledge sharing passion, this week I would be speaking at The Great Indian Developer Conference (GIDS). With over 25000 attendees benefiting over six game changing editions, GIDS is the gold standard for India’s software developer ecosystem. Here are the details. The location of the event (IISc, Bangalore) is close to my heart as I have done my M.Tech. (1999 Aerospace batch) from there. I have my sweet memories associated. If I get time, I would go and meet my professors. With every release of SQL Server there is something new that gets added into the product that we rarely notice. One of this capability is to differ on commit data to persistent disk. SQL Server has always used the Write Ahead Logging a.k.a WAL for ages together to maintain consistency. With new innovations coming into picture, we wanted to expand on a slightly different behavior which most of the NoSQL databases claim, lazy commit. For highly transactional systems or systems that are getting into a bottleneck because of WAL process at the IO subsystem. this feature will greatly help. There are tons of caveats that come as part of this implementation and in this session we will do a quick tour on how this can be achieved. We will also talk about the capability of having a data on a completely non-durable mode and just into memory based structure. These new capabilities are fun to work with and have unique scenarios which we can enable for modern applications and SQL Server 2014. It really amazes us every time when someone says SQL Server is an easy tool to handle and work with. Microsoft has done an amazing work in making working with complex relational database a breeze for developers and administrators alike. Though it looks like child’s play for some, the realities are far away from this notion. The basics and fundamentals though are simple and uniform across databases, the behavior and understanding the nuts and bolts of SQL Server is something we need to master over a period of time. With a collective experience of more than 30+ years amongst the speakers on databases, we will try to take a unique tour of various aspects of SQL Server and bring to you life lessons learnt from working with SQL Server. We will share some of the trade secrets of performance, configuration, new features, tuning, behaviors, T-SQL practices, common pitfalls, productivity tips on tools and more. This is a highly demo filled session for practical use if you are a SQL Server developer or Administrator. The speakers will be able to stump you and give you answers on almost everything inside the Relational database called SQL Server. Above is the first session done by Pinal, Vinod and myself on the stage! I am really excited about that. Along with me, my dear friends Pinal (b|t) and Vinod (b|t) would also be speaking at GIDS. Here is the list of sessions by them on their blog. If you are coming to event, find me and don’t hesitate to say hello. In part 1 of Incremental Statistics, we saw demo about “CREATE STATISTICS …INCREMENTAL = ON” and “UPDATE STATISTICS… RESAMPLE ON PARTITIONS(9, 10). As I mentioned in the closing note of last post, there are few more places where syntax has been enhanced. So, we would cover those in this post. 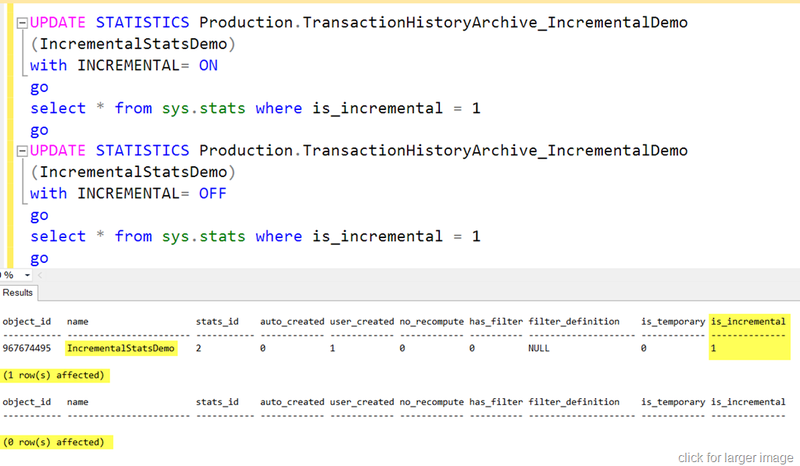 ALTER DATABASE in SQL 2014 provides an option for auto-stats to be created on incremental basis. Here is the command. 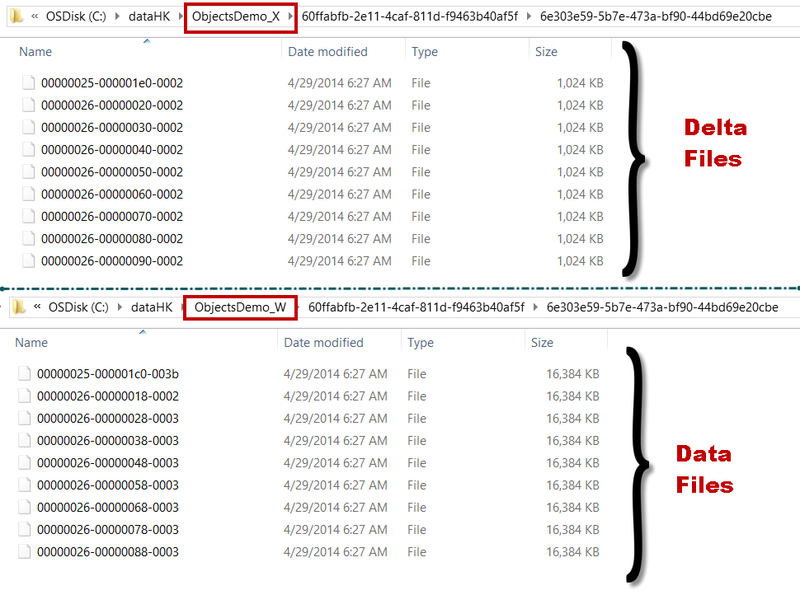 UPDATE STATISTICS also has clause INCREMENTAL ON|OFF. Why? When we specify ON, per partition statistics are recreated whereas OFF would drop existing statistics and recompute the statistics. To identify whether a statistics is created as with incremental or not, we can use catalog view sys.stats. 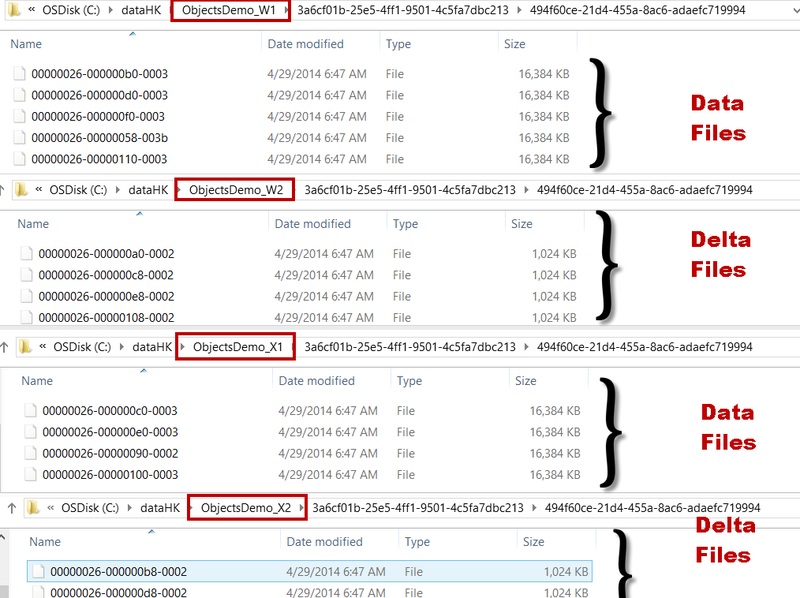 In SQL Server 2014 a new column is_incremental has been introduced. In first select query output, we should see IncrementalStatsDemo and since we turned it off later, the second select should not show the output. There are some error messages which you should be aware of. This type of statistics is not supported to be incremental. First error is self-explanatory. If we attempt to update traditional statistics and provide partition clause, we would get first error. Second error is more generic and can be caused in various situation. Books online motioned those limitation here. I am pasting them below. Statistics created on AlwaysOn readable secondary databases. Hope this blog helped you in learning new feature.